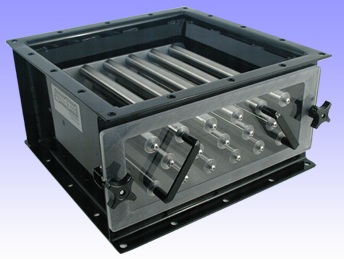 Our Silo Drawer Magnets are designed to fit the bottom of your silos. They bolt between the bottom of the silo and your material take-off box, only adding 8” to the assembled height of the equipment. They are constructed of aluminum or steel powder coated housings with the same flange bolt pattern as your silo. There are three rows of permanent ceramic magnets (rare earth magnets optional) in 1” diameter stainless steel tubes on 2” centers. The front covers are made with 1/2” Lexan® (aluminum optional) and are machined with a step around the edge for a total seal, eliminating the need for pellet-trapping gaskets.